There is an old saying that. 'A good man is hard to find'. The same is true of a phono preamp. Here is one definitely worth discovering. When I started a fresh journey of exploration into valves and vinyl about ten years ago, I had never used a separate phono stage. I was the happy owner of a NAD 3120, which served me well for general vinyl spinning, because it happens to have an excellent phono stage. 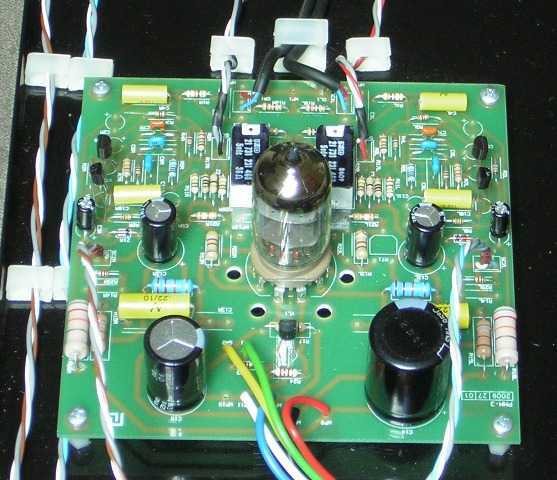 It was only when I started investigating separate power amplifiers, hybrid or just vacuum tube, that I began to look for a good separate valve preamp and phono stage. To sum up ten years in a few lines, I first got myself a valve preamp without a phono stage. This itself was a revelation, and I have never wished to return to a solid state preamp. This preamp did not have a phono stage--I didn't even think of this when I bought it--because I was happy with a small, well-regarded solid state phono stage that I bought around the same time. I was happy, but as the old Duke Ellington song goes, only because I didn't know any better. Then I got chatting with a vinyl lover via email, and we got onto the subject of valve phono stages. He kindly offered me an old one of his to try, an modified version of the Maplins Newton kit. His advice was, 'Ccompare this with your solid state phono preamp, and keep switching between the two until you see which one you stick with.' As he predicted, I stuck with the valve one, even though the sockets were loose and the power transformer wiring inside was barely safe after a previous owner had encased it in resin to limit its mechanical hum! It wasn't perfect and has been criticised for not offering accurate enough RIAA correction, but it added something really important to the pleasure of listening to vinyl. The sound of a valve phono stage is open, spacious, airy ... you can use a range of words to express the same idea. So, when the new Portuguese company Audolici offered TNT-Audio a reasonably priced phono stage for review, I was keen to hear it. Audolici SA (note the spelling, not Aud-i-olici) is based in Porto and aims to produce affordable, quality equipment which combines tradition and innovation. Though the company is new, their engineers have 20 years audio engineering experience. I received a friendly response to my offer to review their AP-01 (note they also offer a double version of the AP-01, the SVP-01) and the review unit arrived promptly. 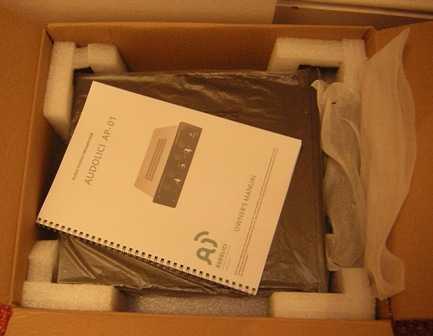 The packing was simple but secure and the amp comes with a basic user guide. The AP-01 is pleasant to look at, though nothing flashy. The black fascia is made of a heavy non-metallic material and the steel chassis has a matt finish which is available in either black or white. The front controls are very simple, consisting of a central on-off switch with blue LED, volume pot and selector switch to change between line and phono inputs. This selector uses relay switching, a nice touch, which keeps the signal path clean and avoids crosstalk, parasitic induction and any ground problems. There is only one line input because this is a phono stage in the first instance. However, I can imagine that many users would appreciate two such inputs, one for CD and other for other AV input, such as from a television. There are ventilation holes in the front, through which you can see the single tube glowing, and ventilation slots below the main PCB on which the valve is mounted. The unit does not get hot in use. At the rear, the gold plated RCA sockets are simply and clearly laid out: one line input, one phono input, and one pair of line out RCA sockets. My used review sample had some small damage to the power socket, apparently by someone inserting a fuse (a 0.25A T type, i.e. slow blow, 250V). Inside things are very neat and tidy, with good layout, quality components (e.g. Bulgin power switch, Alps 100k volume pot, polypropylene caps, their own networking cables), secure construction and good soldering. The power supply PCB is located well away from the main board, and there is no mechanical noise from the transformer. 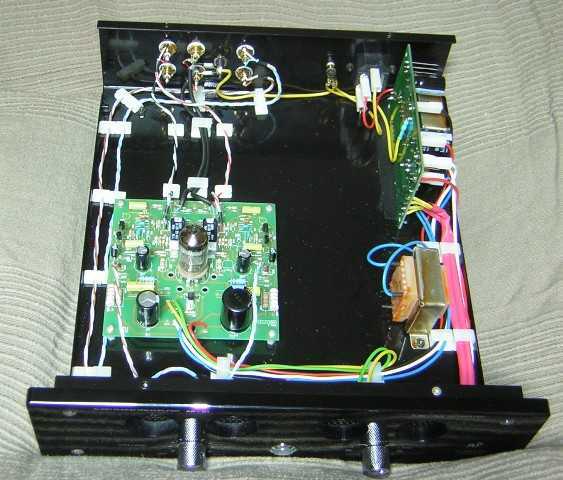 This is a hybrid phono stage which which combines solid state and vacuum tube technology. Audolici calls it proprietory 'tube drive technology'. The website states that it is 'designed for optimal sound reproduction from vinyl recordings' and is suitable for home, business (e.g. disco) and recording studio use. Audolici has a policy of designing its equipment to make use of good quality, readily available (NOS) Russian valves from companies like Reflektor/Sovtek and Svetlana/SED working to military quality control standards. Their valves are selected for low microphony and good signal to noise ratio. Input valves used in their products include: 6H2P-EB, 6H1P-EB, 6H23P-EB, 6H9C and 6H7C. This preamp only uses one valve, the well-regarded 6H1P-EB (add details). The matching power amplifier uses either 6L6, 6550 or EL34, for jazz, swing or blues respectively. 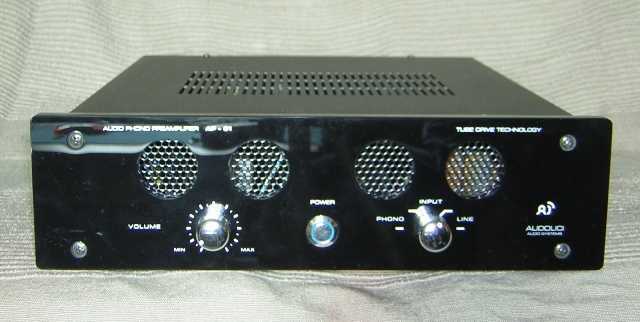 A new amplifier has a recommended burn-in time of 100 hours. This review unit was already run-in and ready for review after about 8 hours of use in my system. The company claims to make products with a detailed, and uncompressed sound and an outstanding sound stage which provide accurate reproduction of communication of the micro-dynamics and tibre of instruments and vocals. The technical basis for these claims is their reduction of the number of transistors in the signal path. They wish to reverse the trend by which phono preamps aimed to to reduce THD by adding more and more transistors to the design. This pursuit of reduced distortion produced a distorted and transistorised sound. Audolici decided to move in the opposite direction, removing a dozen transistors and replacing them with one valve. The result was a tenfold increase in distortion (to 0.01% @ 1kHz) and more 'organic, uncompressed, non-transistorized sound'. The circuit employed here uses transistors at the beginning and a valve as a driver at the end. 'We sacrifice THD specs in exchange of dynamics and transparency.' The published specs for this unit can be seen below. I was ready and keen to test these whether these result in increased dynamics and transparency in practice. Sometimes the job of a reviewer is really tough. The hardest part is when you've checked over all the technical stuff and there is nothing left to do but listen to a high quality audio component. A difficult job, but someone has to do it. So, here I am listening to James Taylor's album Gorilla from 1975. This album isn't quite chosen at random. I usually begin listening tests with a less processed more analogue and acoustic recording. Here, the soundstage is wide and accurate. All the frequencies are there. With a good midrange it is easy sometimes to overlook the extremes, but here the LF is there, perhaps a bit rounded, and the HF is there too, clear but not too sharp. Very listenable. Hey, there is the sax, not credited on the album but there it is. It's probably David Sanborn, because he plays on a later track. The following song is just acoustic guitar, multi-tracked vocals and accordian. It is good to be able to identify the differing vocal overdubs. Amazing, and this is a South African pressing from an era when these were not very highly-rated. Yes, I could really live with this. It is beginning to score highly on Geoff Husband's 'I'll miss you when you go back' scale. The overall impression of this acoustic vocal recording is that there is a good balance, spatially, rhythmically and tonally. Okay, now for some jazz, the great Abdullah Ibrahim from the 1980 album Dollar Brand at Montreux, a live digital recording. I don't really get the short opener, 'Tsakve,' but the second one 'Whoza Mtwana,' (that title could be a misspelling on the sleeve) settles in nicely. It begins very quietly, but then rises to an early crescendo. Wow. Then it's quiet again. Is this Craig Harris' trombone barking and crying? Meanwhile, Alonzo Gardner's electric bass growls urgently. Wish I knew more about jazz. This recording, and the way it is being reproduced makes me want to ask questions like, 'Is that a sopranino saxaphone or an alto sax playing now?' But, who cares, I'm being carried along by the music; I'm with the crowd there on July 18th, 1980. This is the wonder of recorded music. It's a time machine. Another quick change: Tito Puente's 'Oye como va' from Santana's Greatest Hits. Carlos Santana's guitar is crisp and sharp, as is the complex percussion. The cymbals sound a bit soft, but maybe they are at the back of the mix? The organ wails, thin and high, dancing in the air. Down in the bottom the bass is holding the rhythm. The in comes Santana's lead again. You could cut wood with that axe. Oof, the track ends too soon. Now for Mahlathini and the Mahotella Queens, the album Rhythm and Art from 1989. As it happens, this is another 'mass market' pressing. Off we go with 'I'm in love with a rastaman.' The song soon catches me up in the excitement of the performance. Voices leap out from left and right of the speakers. Man the five piece backing band is tight: Ralph Mahura makes his keyboards sound like a pennywhistle and Marks Mankwane's lead guitar darts and dances. I'd get up and dance now if I could find a space in this room cluttered with audio equipment and vinyl. The drums tumble as the choruses fade. On to 'Makhomabaji.' The bass drives the track forward and Mahlathini's lead vocals mesh tightly with the three female backing vocalists. Forget Phil Spector's wall of sound. When the Queens kick in, there is a vocal wall of sound. But again, this preamp makes it easy to identify each of the voices and instruments. This is why good vinyl replay is so satisfying: it shows how much music has been encoded in the analogue tracks. I try another complex live recording 'Whipping Post,' from the Allman Brothers Band At the Fillmore East in 1971. This pretty frenzied, but still there is a good separation of instruments. The Johanson-Trucks rhythm section is pounding away with Berry Oakley keeping up on bass, all showcasing the screaming twin guitars of Duane Allman and Dickey Betts. Too much excitement, perhaps? I put on Brahms recording of his Piano Concerto No. 1 performed by Artur Rubinstein. There is a sense of composure to the presentation of the orchestra. Despite a wide soundstage, with all the parts present and identifiable, there is one orchestra playing. Then, in comes Rubinstein, with the first notes of the concerto ringing brightly. I don't know enough about classical music to judge the quality of this recording or performance, but there is a delicacy and accuracy which holds my attention. A good phono stage invites one to reassess one's vinyl music collection, and this one passes that test. I dig out Wilhelm Backhaus' 1969 performance of Schumann's Piano Concerto in A Minor. The recording is not that impressive, but again there is a delicacy to the reproduction of what is there that keeps my attention. Just another minute, just another minute. This is another sign of good musical reproduction: you want to stay with whatever is being offered, aware that the equipment is making the most of it. This is even true of the next test recording: The Wonder Stuff's first album The Eight Legged Groove Machine (1986/88). This recording is very compressed and thus unenjoyable to me. This phono stage can't work miracles, but it does make it more listenable. At least I can follow the vocal and the percussion has got a little light and shade, but the engineer (I won't name her) has a lot to answer for. This is not the way to record rock. For a lesson, check out the Who's Live at Leeds or 'Won't Get Fooled Again,' on Who's Next. My copy is almost worn away, but when I put it on, Enwhistle's bass bounces along with fuller definition under Townsend's familiar razor sharp guitar licks and Moon's insistent drumming. It's time to end this vinyl assessment. Despite not being a valve-only phono stage, this is one I would be happy to live with. I think that you probably get more from an all valve phono stage, but these are hard to come by. The line stage of this amp is fine. It is crisp, clean, balanced, enjoyable. I have no sonic complaints about it whatsoever, and it offers a sharper focus than my valve only line stage. I spun a number of my favourite test CDs with good results. Maybe a little bright, but that's CD's for you. It is useful to have a line stage accessible at the turn of a switch, but with a good phono stage you will find yourself playing more and more vinyl. This is a well-designed and well-constructed phonostage which could be the ideal complement to a range of quality power amplifiers, including of course the amplifiers made by Audolici (though I have not heard them yet). As with all individual components, it is important to match them carefully. Ideally this means that you should always try and listen first. There are a number of local distributers mentioned on the Audolici website which could be contacted for this. For buyers from countries which do not yet have representation, Audolici can ship directly, with (I am told) a money back guarantee. Many listeners will find that the simplicity and sound of this phono stage suits them. It is a welcome addition to the quality audio marketplace.